John Mann, SCV Historical Society President. ife is not so important as the duties of life." After serving six out of the past 10 years (non-consecutive) as president of the Santa Clarita Valley Historical Society, John Mann is ready to move on. Never a man to mince words, Mann, a resident of Canyon Country, said it's time for a change. "The Historical Society needs a new direction," he said. "It needs younger people to handle it  to come in and grab hold and just move ahead." Mann expressed his confidence in newly elected Historical Society president, Leon Worden, who will take over where Mann left off and work towards making the goals of the Historical Society a reality. Mann said he would like to see all of the historic houses in Heritage Junction restored. "I'd like to see the houses finished up to where tours could be taken through," Mann said. Mann also talked about the train engine in Heritage Junction, known as "the Mogul," that is sitting in pieces and in need of restoration. "Gene Autry gave us an engine from his ranch in Placerita Canyon and we're working on putting it together now," he said. "These are the things that Leon and his administration are working on. The only way things are going to move is with money," Mann said. "Currently they are working to finish the restoration of the Kingsburry house and the Pardee house, which is planned to be the visitor's center." Mann said it's important to keep the history of Santa Clarita alive. "Our motto at the Historical Society is to preserve the past for the future," he said. With the revitalization effort in full swing in downtown Newhall, Mann said the historic sites can play a vital role as a tourist center. "When people visit from out of town, they can see quite a bit of the history of Santa Clarita. By looking at the old houses and buildings, visitors can get a real sense of what things were like more than 100 years ago. I've found the most satisfaction in my years as president, in seeing these old houses restored," Mann said. Mann's own history with the Santa Clarita Valley began more than 38 years ago, when he and his wife Martha moved to California in 1956, from their home town of Easton, Pa.
"I was raised in a different situation," Mann said. "I grew up on a small truck farm in Pennsylvania." His family raised corn and tomatoes and other crop which would be sold to buyers. Mann said they also raised chickens and ducks, mostly for his family's own use. "Back in those days, that's what we usually ate and that's why I really don't care for chicken any more," he said. "There's only so many ways you can do a chicken." While Mann worked hard in the fields on the family farm, he has memories of spending an equal amount of time trying to get out of work. "I didn't care for that lifestyle so that's why my wife and I decided to move to California," Mann said. "I decided there had to be something better." But when Mann first arrived in Huntington, Calif., he was without a trade. He later moved to Bell Garden. "I didn't have a job, so I got lucky and found work in a print shop," Mann said. "I worked two jobs, 16 hours a day for four or five years. Back in those days, big money was $1.75 per hour, then if you got to know your stuff a little better, it might go up to $2.50 an hour." In search of affordable housing the Manns moved to the (then) rural community of Santa Clarita. "Things were a lot different then. When we moved up here in 1964, there were maybe 5,000 people in the whole area," he said. It didn't take Mann long to get involved in the small community that he and his family chose to call home. "I've been involved in volunteer work for most of my life," Mann said. As father of John Jr. and Debra Lynne, Mann became involved with scouting in the late 1960s. "I found I enjoyed working with people," Mann said. Later, Mann would join the Rotary Organization. "I liked the idea behind the Rotary, of helping others and being of service to others and so forth," he said. "We now have so many great organizations in the valley, and that's a good thing because it makes for strong communities." 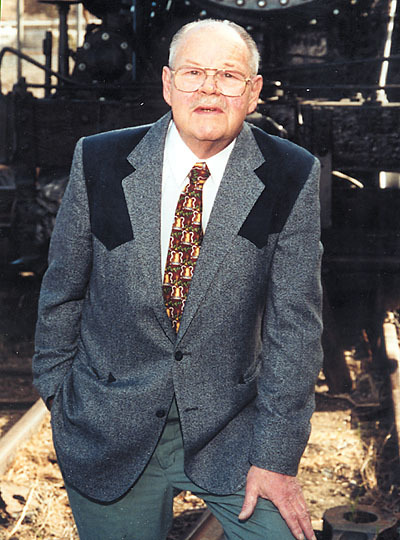 Mann was a member of the Rotary Club for 14 years and served as the Rotary's president from 1996-1997. "We worked with the community and helped out with city events," Mann said. "We helped those around us who needed help." Although no longer a Rotarian, Mann made a lasting impression on current Rotarian Greg Nutter. "He had a good year as president of the Rotary," Nutter said. "We got a lot done that year." Under Mann's leadership, the group replaced a fountain on the grounds of the William S. Hart Mansion in Newhall. "He's always the guy who does a lot of stuff behind the scenes, and he's willing to help out charity organizations," Nutter said. Nutter explained that Mann prints up raffle tickets, flyers and programs for various events such as the Wine Auction, which helps support the meals on wheels program for the Santa Clarita Valley Senior Center. "He does good stuff and he's a good guy." In the early 1970s, Mann and his son were instrumental in opening up the first Red Cross office in the Posada shopping center on Lyons Ave. in Newhall. "It was not really a full-fledged office at the time, but my son and I taught a multi-media course in first-aid," Mann said. "I think it's important for every member of the community to contribute in any way they can to make our communities a safe place to live." In addition to his other contributions to the SCV, Mann has served on the board of directors to Friends of Hart Park, a non-profit support group, for more than seven years. Historical Society treasurer and board member of six years, Glen Rollins credits Mann's dedication and hard work as a contributing factor to the success of the Historical Society. "John has been an anchor and a stalwart supporter of the Historical Society," Rollins said. "It takes a special talent to put people to work for free. John has an enormous amount of passion for what he does and he's given a lot to this community. We're very proud of everything he's accomplished." As a member and past president of the Historical Society, Mann's contributions will no doubt have a lasting effect. Tom Frew, corresponding secretary of the Historical Society recalls going to Mann for advice on a number of occasions. Frew served as president of the historical society after Mann had served a term as president. "Whenever I thought I was getting in trouble on something, I'd always pick up the phone and call John, and his counsel was always very good," Frew said. "When I was president, I used his wise counsel because I knew he had been president the year before. He had been through it before and he knew the personalities involved. He has very good insight." But Frew also enjoyed giving Mann a good ribbing every now and then. "If I thought he was doing something wrong, I'd always give him hell," Frew said. Frew recalled a funny incident at last year's Cowboy Poetry Festival. While in charge of the beer and wine booth, "John came up to me, and said, 'how's everything going?' And I said things were going fine, but a couple of people didn't show up, and John said he couldn't believe that and asked, 'who wouldn't show up?' And I said, well you were one of them," Frew said. Historical Society board member Philip Scorza shared some humorous insight about Mann as well. "Winston Churchill once said about Franklin Roosevelt: 'Meeting him was like opening your first bottle of champagne.' To paraphrase: 'Meeting John Mann is like opening your first bottle of Bromo Seltzer. Sooner or later, something's about to come up,'" Scorza said. "All humor aside, John has devoted a lot of time and effort to the Historical Society," Scorza said. As Worden takes over the reins where Mann left, he knows he can always look to Mann for counsel and advice. "John has been a mentor to me these past several years," Worden said. "John's strength is in his ability to recognize the talents of his individual board members and to help them shine in a way that benefits the organization. His leadership has united an extremely diverse group of people and set them on a course toward goals that are bigger than the sum of their parts." As a proud grandfather to granddaughter Amber, 15, Mann would like to see the historical society become more involved with educating children about Santa Clarita's past. "Somewhere in those goals, we want to get children more involved with the Historical Society," Mann said. "It's important to keep our history alive for them so they can take pride in their heritage and pass it down for generations to come. "We want to let the community know we're here to help out," Mann said. The recently released Historical Society president said Worden is taking an active role in sparking the interest of children in the activities of the Historical Society. "There's a bright future ahead for the Historical Society and it's been my pleasure to serve as president and I thank everyone for their support," Mann said. ©2001, THE SIGNAL · USED BY PERMISSION · ALL RIGHTS RESERVED.